Saturday, 11AM PST / 2PM EST / 7PM GMT join us for This War of Mine stream with UNIT LOST! Before we talk about today’s show and community streams there’s quite a big piece of news we’d like to share with you. Another of our friends decided to drop by Twitch.tv/GOGcom. Many will recognize him from his work on YouTube. A gamer, entertainer, philanthropist, and scholar, the man behind the red beard: Jesse Cox! On Saturday, December 6, he’s going to stream for you either the awesome sonic-speed retro-platformer Freedom Planet, or the beautiful tactical jRPG Agarest: Generations of War, and it’s up to you which one he’ll be taking on. Place your votes at this Straw Poll page (the poll closes this Friday). Then, in our standard Saturday broadcast window – that is 11AM PST / 2PM EST / 7PM GMT – we invite you for another look at This War of Mine, the latest indie phenomenon made by our immediate neighbors – 11 bit studios. Who’s hosting? The Great British Gaming team known as Unit Lost found its way (*ba-dum pssshh*) to Twitch.tv/GOGcom and joined the ranks of our growing streaming community! Don’t miss the streams, and please follow our channel! We want YOU for GOG.com Community streams! For over two months now, on Twitch.tv/GOGcom, we’re bringing you gaming live streams of GOG-catalog games. Hosts such as Quill18, TotalBiscuit, Rurikhan, and BaerTaffy show you around some of our new releases or take you back to reminisce upon some of the beloved classics. We’ve amassed enough entertaining content that it would take you a day and a half of non-stop watching to see it all, and we’re quickly approaching the 10 000 follower mark. At that point we can say it out loud: we love Twitch, we enjoy live gameplays, and we’re looking forward to having even more streaming fun – together! We want our Twitch.tv/GOGcom channel – just like GOG.com itself – to be a very special place on the map of gaming Internet. A place to share your passion for games with others, no matter if you’re a YouTube celebrity with a bazillion subscribers, or someone taking their first steps in streaming games to public. We’re all gamers, and each of us has something unique to show or tell the world! We’ve already invited a few of our community members to join in on the fun, now we extend this invitation to every gamer on GOG.com! If you feel that streaming games to GOG audience might be your thing, just drop a note in the comments below this post with a link to an example of your work on YouTube or Twitch and the title you’d like to play on our channel. We’ll do our best to give everyone so inclined a chance to shine! A virtual table-top realm opens! The Witcher Adventure Game, the digital installment of the Fantasy Flight board game set in the dark fantasy realm of The Witcher, is available 10% off for the first week on GOG.com! If you were taking part in the beta-test program for this title, you get a special (non-stackable) 40% off discount, valid until December 27. 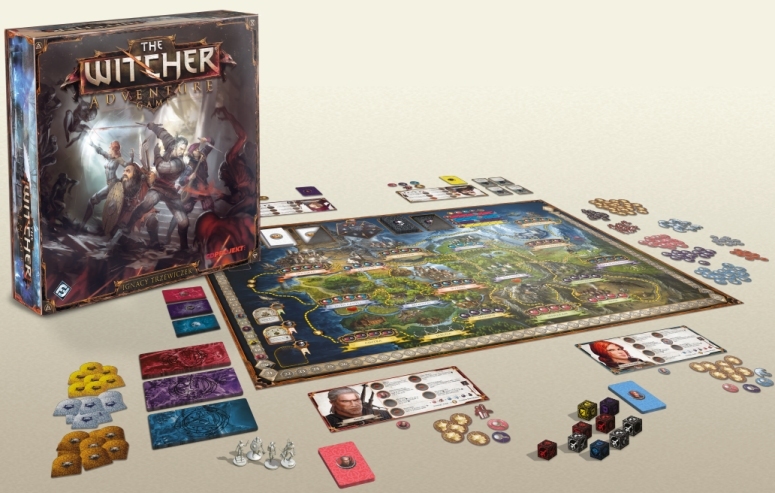 The Witcher Adventure Game takes players on a journey across the world of the Witcher as they assume the roles of four distinct characters known from the books and video games: Geralt of Rivia, monster slayer; Triss Merigold, cunning sorceress; Yarpen Zigrin, dwarven warrior; and Dandelion, roguish bard. Each character has unique skills and multiple ways of overcoming obstacles – the choice is yours: do you fight your way to victory, call on your charm or try your hand at diplomacy? It’s the true spirit of board gaming brought straight to your computer screen. Set in the mature and brutal world of The Witcher the game features 4 unique heroes with different skills and approaches to problem solving. With clear, simple rules and intuitive mechanics, tons of quest cards allow players to tell a new tale every time they play. Look adventure in the eye in a world with which you’ll fall in love! Get The Witcher Adventure Game, for only $8.99 (or $5.99 if you were among the beta-testers! ), 10% off until December 4, 10:59AM GMT, on GOG.com. The 40% off special discount for beta-test participants remains valid one month after the game’s release until December 27. In The Witcher Adventure Game, you race against your opponents to gather the most victory points and work together to complete quest objectives. We think it would be fun to find out whom you would like to see in the game (and reward you for it!) – which brings us to the object of this character creation contest. Pick a character from the Witcher universe, describe their role in The Witcher Adventure Game along with a special ability they can use and 2 skills they can choose to master. Then, post your entry in the forum thread for this news post, making sure it’s only up to 100 words long. In the game itself, you can take on the role of one of four characters from the Witcher universe – so make sure you don’t double up on the ones that already exist in-game! — Geralt of Rivia, the monster slayer – single-handedly eliminate your opponents with the help of powerful potions or witcher signs. — Triss Merigold, the cunning sorceress – you can protect yourself with magical skills and cast spells in battle on your opponents. — Yarpen Zirgin, the dwarven warrior – call on the help of your fellowship of dwarves to aid him in battle. — Dandelion, the rogue bard – become a cunning diplomat and talk your way out of conflicts, bribe your opponents with gold or threaten to call on more powerful friends. Wednesday, 2pm EST / 11 am PST / 7pm GMT, join our GOG Classics – Giants: Citizen Kabuto stream with Outstar! Now, give a warm welcome to Outstar, a former member of The Witcher 3 dev team, digital artist, and flat-faced cat lover. Today, in our GOG Classics show, she begins her series of let’s plays showing you around the fascinating world of Giants: Citizen Kabuto. The stream begins today, 2pm EST / 11 am PST / 7pm GMT at the usual place: Twitch.tv/GOGcom. Not exactly Twitch-savvy? No problem! You’ll be able to see the whole thing right here (and if you’re not sure when the stream starts, there’s a handy countdown at the bottom of the very same page). Don’t forget to follow our channel on Twitch, as there’s many more increasingly exciting things on the way! Downloaded, a documentary by Alex Winter focusing on the spark of revolution in digital goods distribution that was Napster, is available DRM-free on GOG.com. Downloaded focuses on the advent of digital media sharing, including the rise of game-changing company Napster and controversial pioneers Shawn Fanning and Sean Parker. The digital revolution ultimately created a technology paradigm shift and upended the music industry. Audiences will hear insight from well known music artists and figures within the music industry including: The Beastie Boys’ Mike D, Noel Gallagher, Henry Rollins, former Sony Music Chairman, Don Ienner, former record producer and Island Records founder Chris Blackwell and Hilary Rosen, former CEO of the Recording Industry Association of America. Make no mistake, they WILL hear you scream! Aliens vs Predator Classic 2000, a suspenseful Sci-Fi first-person shooter with three very different single-player campaigns, one for each species, and a frantic multiplayer mode, is available 50% off, DRM-free on GOG.com! Aliens vs Predator Classic 2000 features the Colonial Marine, Alien and Predator Campaigns and the frenetic single-player Skirmish mode from the original title: Alien Versus Predator Gold Edition, which was released to massive acclaim in 2000. It’s been updated for modern systems and includes support for Xbox 360 Controller. The three most ferocious species in the universe in a bloodthirsty battle for the ultimate prize: survival. One wrong move turns you from hunter to prey. Deathmatch, Species Deathmatch, Predator Tag, and Cooperative modes await for you in the multiplayer section! Humans, Xenomorphs, Hunters – it’s time to establish once and for all, which of them is the deadliest species in the Universe, in Aliens vs Predator Classic 2000, 50% off until Tuesday, December 2, at 10:59AM GMT. Saturday, 2pm EST / 11 am PST / 7pm GMT, join our community stream with Flaose! Now, give a warm welcome to Flaose, a long-time GOG.com community member and award winner in many of our creative contests. You might know him from around our forums, now it’s time to join him as he plays Shadows: Heretic Kingdoms, the newly-released beautiful sequel to now decade-old hack&slash classic Heretic Kingdoms: Inquisition (a.k.a. Kult: Heretic Kingdoms). The stream begins this Saturday, 2pm EST / 11 am PST / 7pm GMT at the usual place: Twitch.tv/GOGcom. Not exactly Twitch-savvy? No problem! You’ll be able to see the whole thing right here (and if you’re not sure when the stream starts, there’s a handy countdown at the bottom of the very same page). Don’t forget to follow our channel on Twitch, as there’s many more increasingly exciting things on the way! The Marvelous Miss Take, a fast-paced comedic heist game with an engaging story, challenging you to think and act quick is available for Windows and Mac, DRM-free on GOG.com! The Marvelous Miss Take turns the stealth genre on its head by using organised chaos to keep players on their toes. Successfully pilfering portraits isn’t as easy as it may seem: wandering guards decide their patrol routes on the fly, security cameras keep watch over everything and even innocent gallery goers just visiting to admire the art might raise the alarm if they see something suspicious. Only by using quick wits and even quicker reflexes can players hope to grab the loot (that rightfully should be yours, to begin with) and escape unseen – there’s no option for violence and the clock is ticking! With a funny, engaging story written by BAFTA winner James Leach, cartoony presentation, and 25 multi-floored galleries to pay a visit to, The Marvelous Miss Take makes cat burglary fun and cheerful again! The classic hack&slash saga continues! Shadows: Heretic Kingdoms, a dark hack&slash-type action-rpg with an original story and imaginative gameworld, is available at -20% for Windows, DRM-Free on GOG.com, with Book 1 available right now, and Book 2 coming in February 2015. Shadows: Heretic Kingdoms is the next chapter of the Heretic Kingdoms saga, set a few years after the events of Kult: Heretic Kingdoms, players are caught up in a terrible conspiracy and propelled upon an epic journey through a world of dark fantasy. Epic battles and unexpected plot twists await those brave enough to rise to the challenge! Take control of the Devourer, a demon that swallows the souls of the dead and brings them back into the mortal realm as puppets. But is the demon their master – or their servant? If you played the classic Kult: Heretic Kingdoms, if you enjoy dark fantasy stories full of demonic powers and ominous magic, or simply if you enjoy slicing and dicing through hordes of enemies, you should check out Shadows: Heretic Kingdoms with a special -20% promo for the first week on GOG.com! A documentary series about making games in 48 hours. Super Game Jam, a fascinating documentary series about the refreshing gamedev trend of creating games in 48 hours is available in streaming and as a DRM-free download on GOG.com. Super Game Jam is an engaging new documentary series following some of the world’s most talented indie game developers doing what they do best. Filmed in five cities over a six month time period, each episode pairs two indie developers together for 48 hours and challenges them to create a game based on a theme suggested by their peers. The series examines the creative process, technical skill, and friendships that form through a game jam event on a more personal and intimate level.